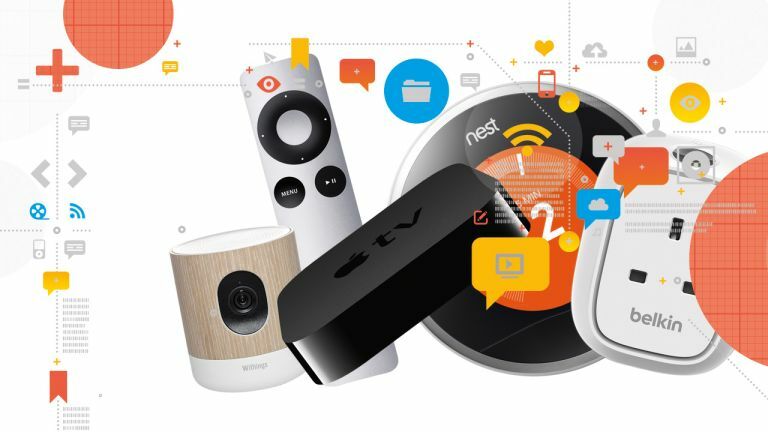 Now that the likes of Apple, Google and Samsung have all got smart home foundations in place, the connected home revolution should start picking up some pace. To get you prepared for the coming onslaught of domestic kit, we've picked out some of the key smart home terms you need to know. An actuator is the general term for a mechanism that's triggered into action by a sensor – for instance, a security camera that's set off by a motion detector is an actuator. Launched by Apple in 2010, AirPlay is a wireless protocol that enables data streaming (audio and video) between two compatible devices over a Wi-Fi network. It's more stable than regular DLNA, but only works with AirPlay-equipped kit. One of the biggest names in home automation, AMX builds scalable solutions for the home and corporate smart buildings. Apple has been a minor player in the smart-home game since the launch, in 2007, of Apple TV, which debuted a multimedia player called FrontRow. But its influence is expected to soar with the advent of the Apple Watch and the introduction, in June, of HomeKit – a framework that will enable devices from different brands to work together using Siri as a spoken interface. Think HAL in 2001: A Space Odyssey, but without the meltdown – we hope. It's early days, but already Elgato has designed a suite of elegant sensors and actuators to work around the system – expect many more to follow soon. The use of electronics to complete various household tasks with minimal human interaction. Which sounds quite lazy when we put it like that. Belkin's ecosystem of smart devices, WeMo, makes a fully automated home possible – and if you're prepared to install it all yourself, it won't cost you a fortune. Your journey to smart-home smugness might begin with a single WeMo bulb that simply screws into an existing fitting. From here, it will find your home network and become controllable via the WeMo app. Plug a WeMo switch into any mains socket and whatever you plug into that will also be visible on your phone. The WeMo Maker is a bit more advanced because it can be configured to trigger mechanical devices: ie making a garage door lift when a motion sensor sees a car approaching. Bluetooth Low Energy is a useful wireless protocol for connecting portable devices in the same room. In its fourth generation, it requires very little power to function. The Custom Electronic Design and Installation Association is where you'll find brands and people experienced in professional smart-home installation. Its website also offers downloadable resources. Established by Sony and Intel, the Digital Living Network Alliance ensures that compatible wireless devices can recognise each other and share data streams over Wi-Fi. Take a contraction of the Latin word for home, domus, and combine it with robotics, and you get the fancy name for home automation. Eve is a family of smart-home sensors and actuators designed by the German peripherals specialist Elgato to work with Apple's HomeKit. They include a weather sensor, a door lock and a smart plug, all of which use Bluetooth LE rather than Wi-Fi to communicate, and don't need a hub. The name given to renewable energy that's derived from the Earth's natural heat. If you can drill a hole deep enough, or lay enough cable beneath the subsoil to harvest it, you'll obtain a natural power source for life. British Gas's answer to Nest (see below), Hive works in the same way – enabling you to control your thermostat over the internet using your smartphone. One advantage of this version is that you can adjust your hot water, too. Each ecosystem of smart-home devices tends to communicate with its own wireless hub, which sits on your home network collating the data for interpretation by a phone app. Hue is Philips's growing family of smart lighting products that can access a home network and hence be remotely controlled by the Hue app. An easier way of saying heating, ventilation and air conditioning. Insteon is a smart-home technology that enables lights, thermostats, switches, motion sensors and other such electrical devices to communicate through mains power lines, radio frequencies or both. The Internet of Things is the catch-all term given to the growing number of household devices that can log on to the web to enhance their functionality and enable remote control. While it was once an odd niche, everything changed for the IoT when we began carrying smartphones with apps that suddenly made accessing these disparate devices very immediate and useful. Take security cameras – instead of logging on to a PC to see some grainy footage your camera filmed earlier, as was the case before, you can now glance at your phone to see what's occurring in real time back home. However, it's the iKettle – a kettle that can be boiled from your phone even when you're overseas – that will forever be hailed as the ultimate thing among the Internet of Things. An internet protocol camera sits on your home network, enabling you to access it anywhere via the internet and an app on your phone. This is a system whereby sound can be streamed between a media player and speakers in different rooms of the house, usually over your Wi-Fi network. Near Field Communication enables devices in close proximity to one another to detect each other and share data without the need for an internet connection or a pairing code. NFC simplifies streaming between media players, and forms the basis for Apple Pay and Google Wallet. Instead of transmitting electrical current like your average lead, this glass cable uses light, which means you can fit huge amounts of data down a relatively thin pipe. Smart homes often incorporate solar panels, because the clean power these generate can feed into a smart grid to be used during the night, or when demand is high. Defined as an artificial agent – usually an electro-mechanical machine – guided by a computer program, robots could have a key part to play in the smart homes of the future. So far, we've only trusted them with vacuuming the floor and mowing the lawn – see our feature in T3 242 – but helper 'bots like Jibo could prove invaluable as an interface between us and our other smart-home devices. With the ability to sift through emails, read out notifications and answer questions, a role as personal assistant seems the most likely. Samsung's answer to AirPlay uses DLNA to enable Samsung products to readily share data over the internet. These are devices that detect change, whether that be temperature, noise, light, motion, etc. They can be used to trigger another device, called an actuator, to make something useful happen (ie a smoke alarm to go off). As we all switch over to renewable energy sources, such as wind and solar, the excess power generated can be fed into a wider smart grid. It can then be used in areas where there's greater demand, or stored in cells until needed. A keyless lock that requires the correct wireless signal from a smartwatch or phone to move the deadbolt. Bluetooth LE is the preferred protocol, as it's less likely to suffer from a flat battery. This is a modular system of hub, sensors and actuators that monitors and secures your smart home. The flow of data from a media player to an end user. A programmable device that thinks it can replace all your other remote controls. They never can. The French company has been expanding the IoT with health, security and wearable gadgets that all use an internet connection to bring functionality that hadn't been thought of before. It all started with the Body Scale, which sent your weight and body-fat index wirelessly to your Mac for easy and immediate analysis. This soon led to activity trackers, a blood-pressure sensor, and various baby monitors and security cameras – all of which offer some kind of enhanced functionality. The other common denominator is their clean and simple design, which ensures that these slick products always find their way into the Apple Store. California-based Nest Labs changed the rules of central heating forever by posing two questions: why are thermostats so ugly, and why are they so dumb? Its Learning Thermostat is an object of desire that can be adjusted remotely and feed data back to the app for analysis. In 2014, Google paid $3.2billion for the company, whereupon it encouraged a whole ecosystem of third-party products bearing the tag 'Works With Nest'. These smart-home hopefuls range from electric fans that switch on when it's hot, to an electric car charger that knows when to draw cheaper, off-peak power from the grid. A wireless protocol useful for passing small data packets, Z-Wave avoids interference with Wi-Fi and Bluetooth on the crowded 2.4GHz band. Useful for transmitting data up to 100 metres between devices that require long battery life, ZigBee is a simpler spec for wireless personal area networks than Wi-Fi or Bluetooth.